After buying the more modern but cheap imitations of oil cloth, I decided to try real oilcloth. I couldn't be happier! It may cost a bit more but it will last much longer! My grand kids are more apt to damage the cheaper variety. They can't crunch the edges on this one as they did the other variety. 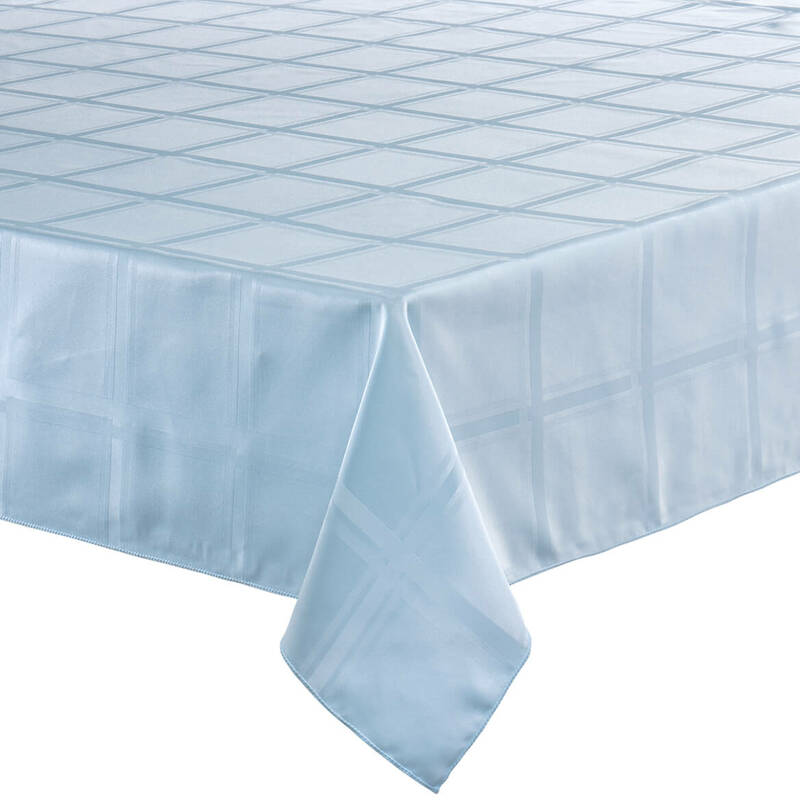 needed a table cloth that could handle spills without staining and could be laundered and hold up.this item meets all my needs. I am going to get another one soon. 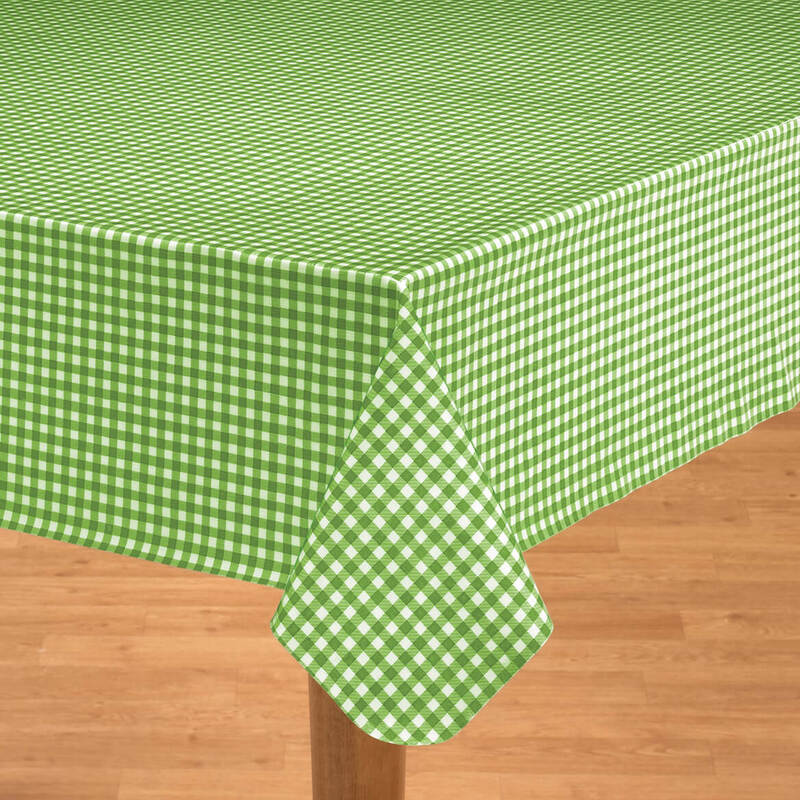 This kind of table cloth reminds me of my vgrandmothers kitchen. I have been looking for one for a long time. I am glad that you are offering them. 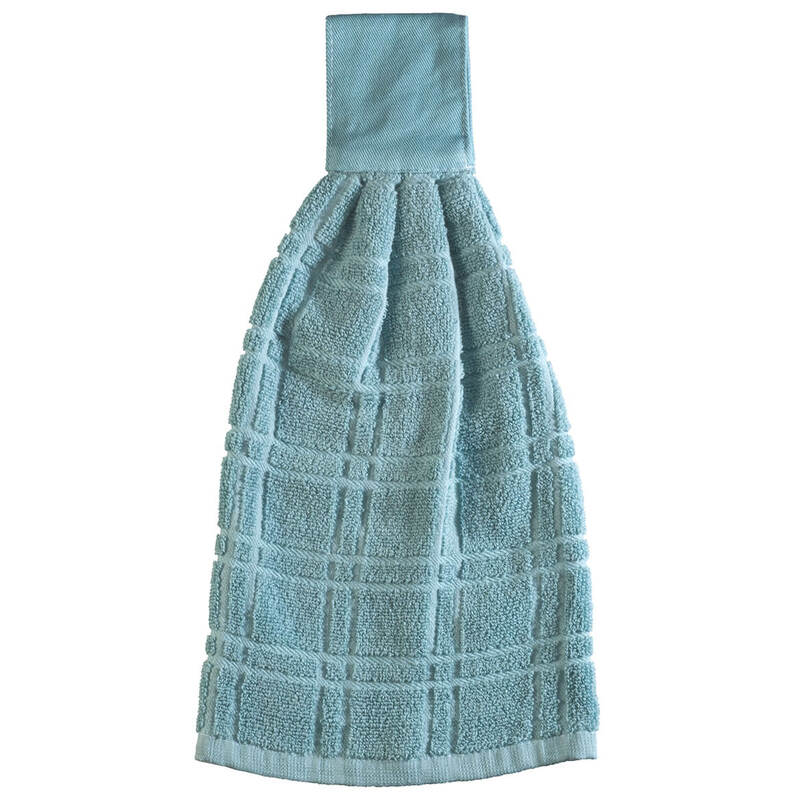 I used this for an outdoor pool party/BBQ in 110 degree weather...it was perfect. It looked great with our decor and was very easy to clean. I am going back for additional colors! Very nice in my kitchen. Looks and wears very well. 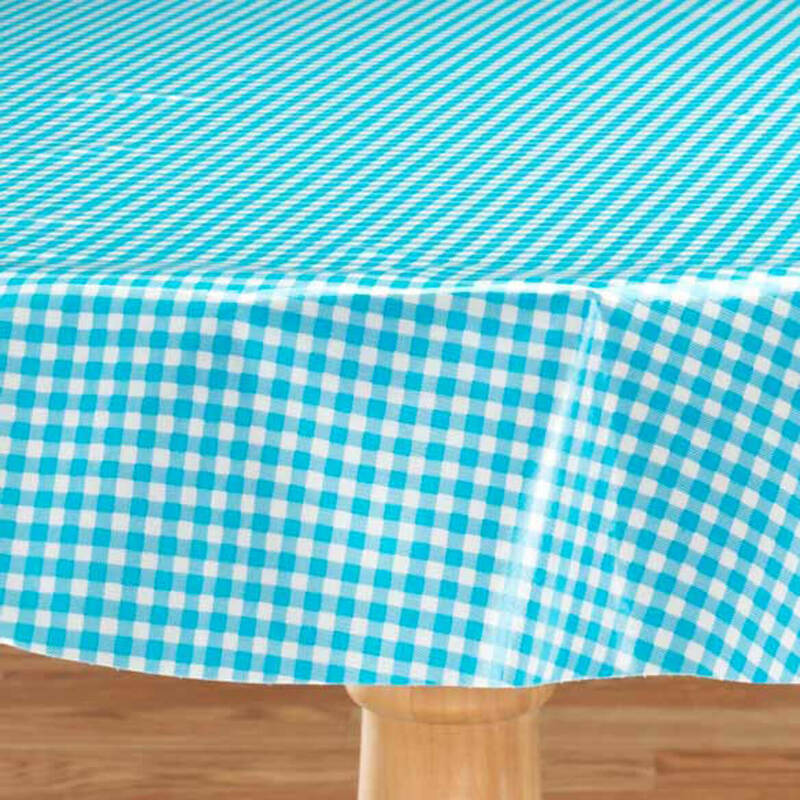 I have been buying other vinyl tablecloths for many years and need to replace them about every 2-3 months because my cat gets her claws caught in the tablecloth---not this oilcloth. This is just like the oilcloths my grandmother had on her table. Love it. Finally, I found what I was looking for. I had been looking for a yellow tablecloth. 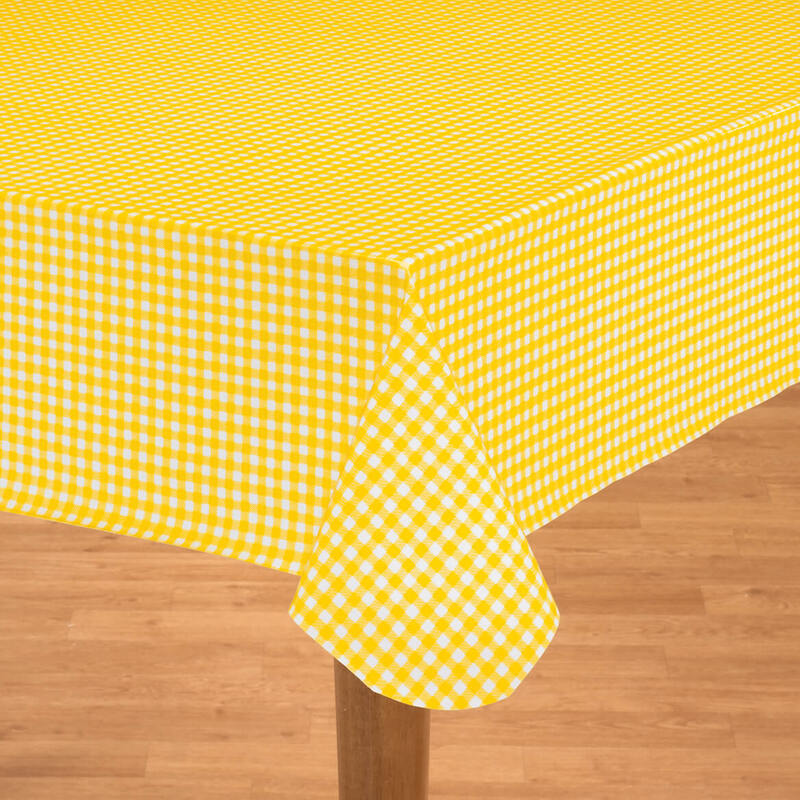 I found a beautiful yellow Gingham Check Oilcloth Tablecloth in Miles Kimball. I looked through many, many different catalogs, but I could not find anything that I wanted. I finally found the tablecloth here in Miles Kimball. I was excited when I got it in the mail. 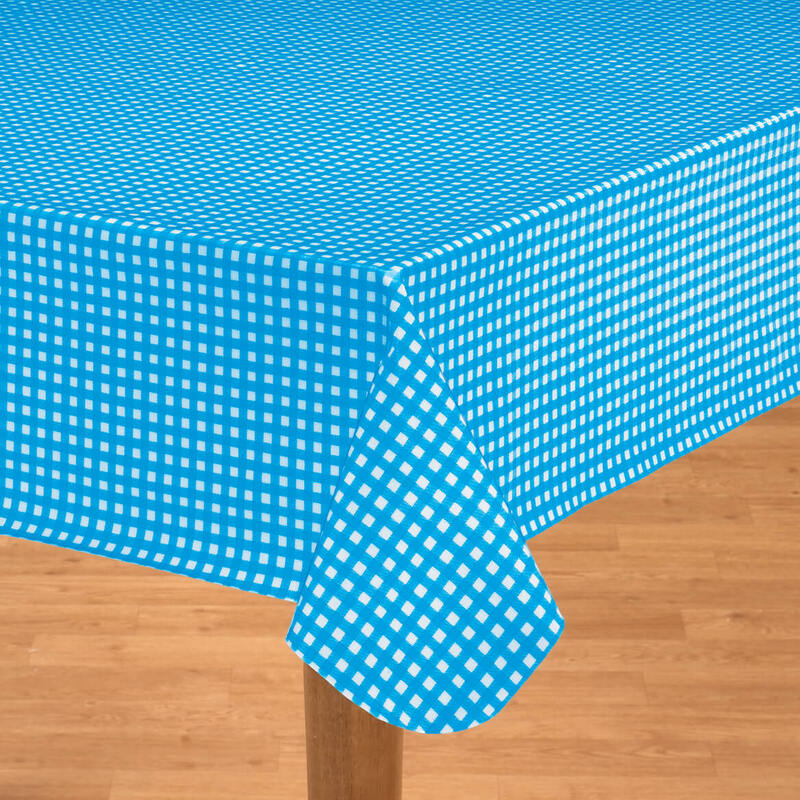 I would recommend this Tablecloth to my family and friends. How do I go about getting a rebate?? This is an excelant tablecloth!! So easy to keep clean and think it will wear well. The vinyl ones are paper thin and tear, or leave heat impressions if too hot a plate or bowl is set down on them. Not this baby. 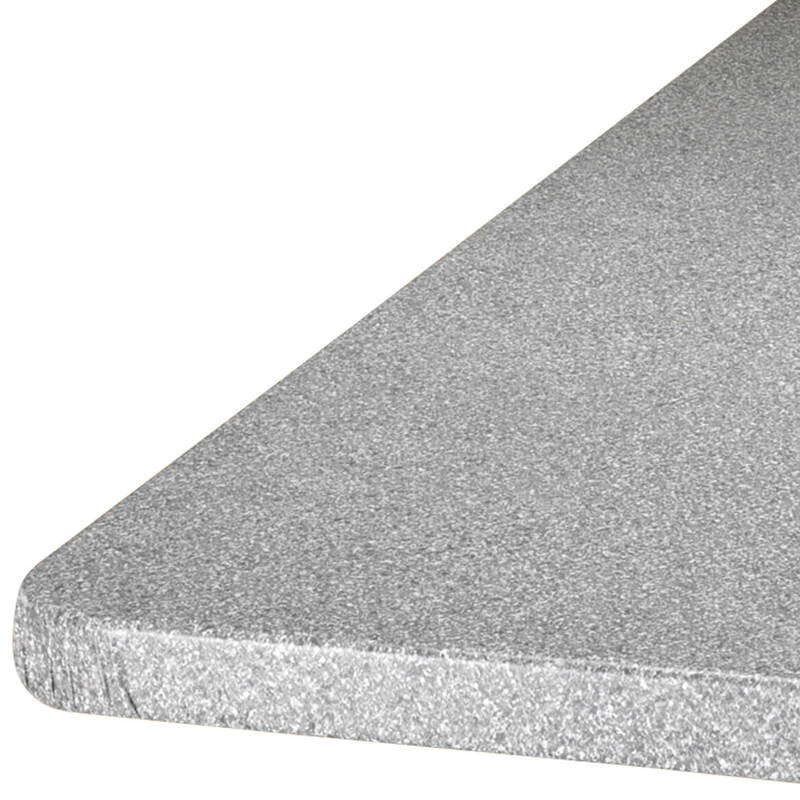 It's made from a heavier weighted material and is a dream to wipe off. I'm back to purchase one in another color. The RED Checkered one reminds me of the kind of tablecloths used in little Italian restaurants or retro diners. It DOES NOT HAVE A FELT like backing if you're expecting it, and it's not as heavy as Grandma's or Mom's that you remember from the 40's & 50's. They don't make the linseed oiled canvas ones anymore because of it being fire hazard. This is about as close as you can get. It's a great value. I burned a hole in a friend's plastic tablecloth with a cookie sheet. Looked for a replacement and found nothing comparable in design and quality. Then came my copy of Miles Kimball new catalog. Hooray! There was the replacement, I called to order it and the nice gentleman said it wasn't in stock but would take about a week to get it in. It was exactly what I wanted so I told him to order it for me. And within a week it was on my door step. My friend was so happy with the replacement and I sure felt relieved. I plan to use this tablecloth on my outdoor 42" round table. I made the assumption that the cloth was for a 48" table not 48" in diameter - my mistake. Consequently the cloth is too small with very little overhang. I'll put another cloth underneath it and hopefully this will work. I like the oilcloth as it is easy to clean but would have liked a finished edge. Hope they hold up to my rough guys. Possibly a kind of blanket stitches edge so it will not fray could be done. The color has not faded after many clean ups after meals. Easy to wipe off. Protects my wood table very well. Just wonder if there could be a more attractive design as this looks like an old fashioned pattern. If 48" x 70" is your table measurement order larger size otherwise you will be disappointed as I was. 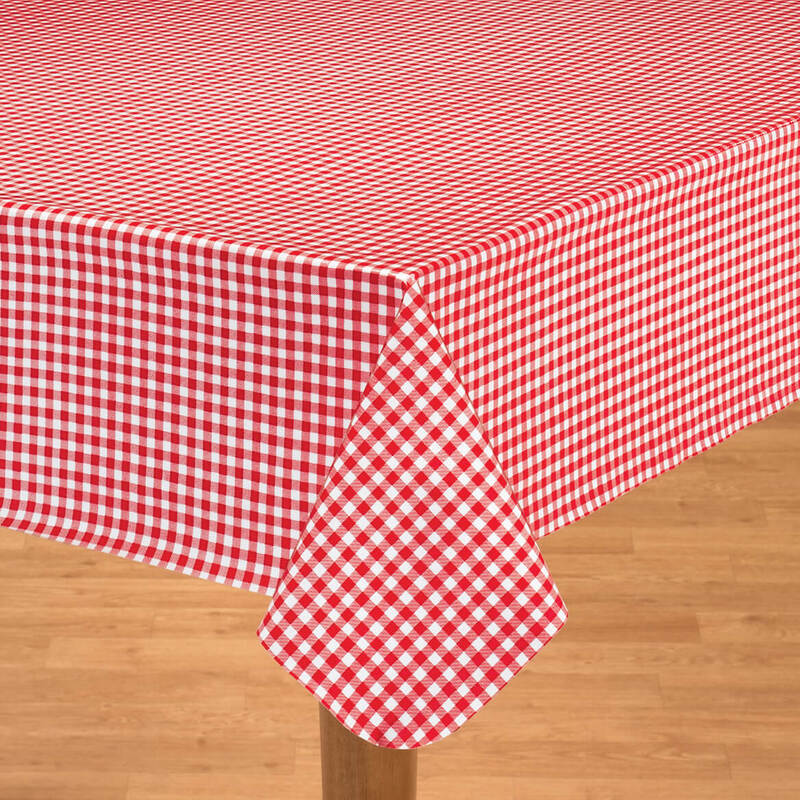 I ordered the gingham oilcloth cherry thinking there would be additional width and length but I was wrong. I love it but it was to small so it was returned. I purchased this thinking it would work on our outdoor table. I tried it on my indoor table and found that since there is no backing it does not stay in place well. I will not use it outside because of wind. I feel this item was over-priced for what you get. 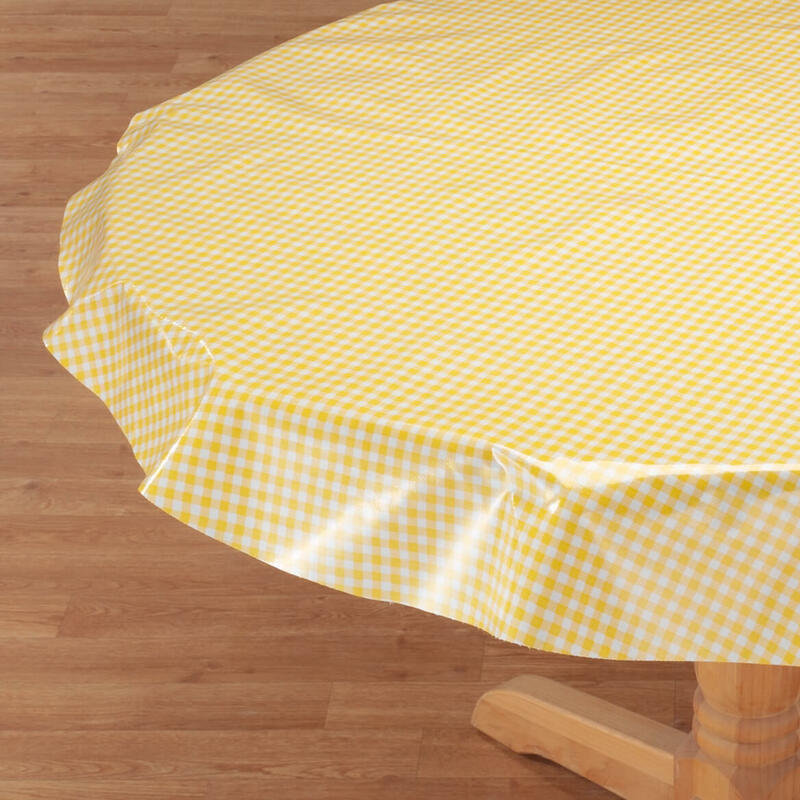 Ordered 48 " round pale yellow table cloth with cotton/poly backing. Received bright yellow, noted as 47.5" round, but it is irregular, not round. It's 46 3/4" x 47 1/8" x 51" x 52". Not round in my book! And no backing! Will not order again. Still trying to find out how to remove the creases. Can't use until I can remove creases. terrible, will never buy from you again. 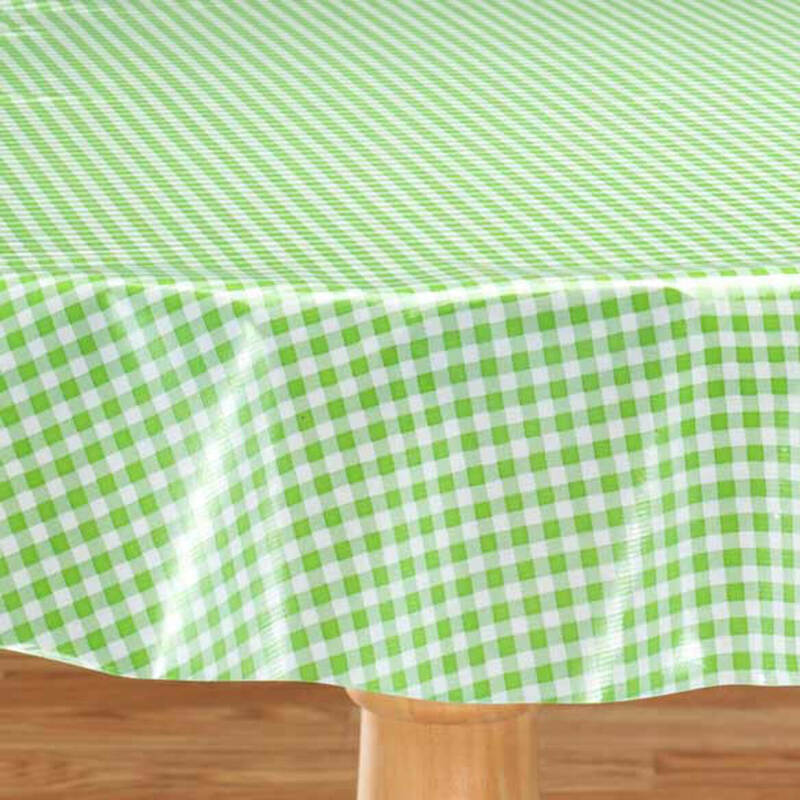 Was looking for a picnic tablecloth for daughter-in-law. It seems sturdy and cleans easily....pretty too! Bought one before and was very satisfied with it. for my table to match my kitchen dÃ©cor. Good quality oil cloth. I have a smaller one and it still looks the same as the day I bought it. wanted table clothe that would last a while. because it lasts a long time. Good material. For my mother use, in her kitchen. 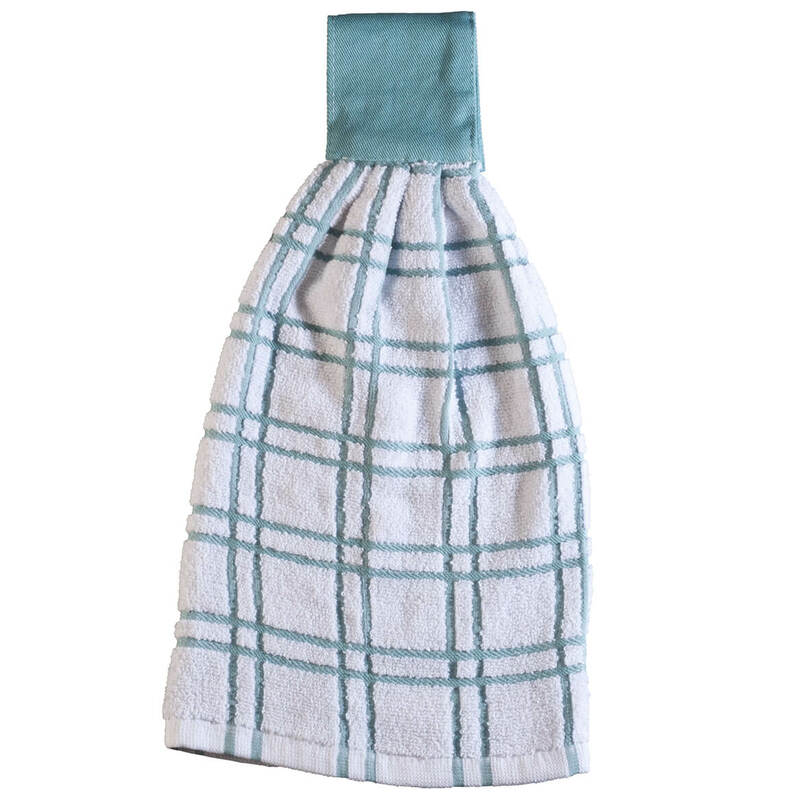 The oilcloth is easy to clean and lasts forever. easy clean up for family / kids etc. my table is oblong, 42"x52". What size should I buy? BEST ANSWER: Buy the 48 X 70 And cut the long end to the size you want. My table is the same size and this is what I do because I love the oilcloth. I only wish Walter would get the oilcloth in different patterns. I always go by how much you want the over hang to be, my mom wants to add at least a two inch over hang. My table is 28" x 95". I have 11 tables that are this size to cover. 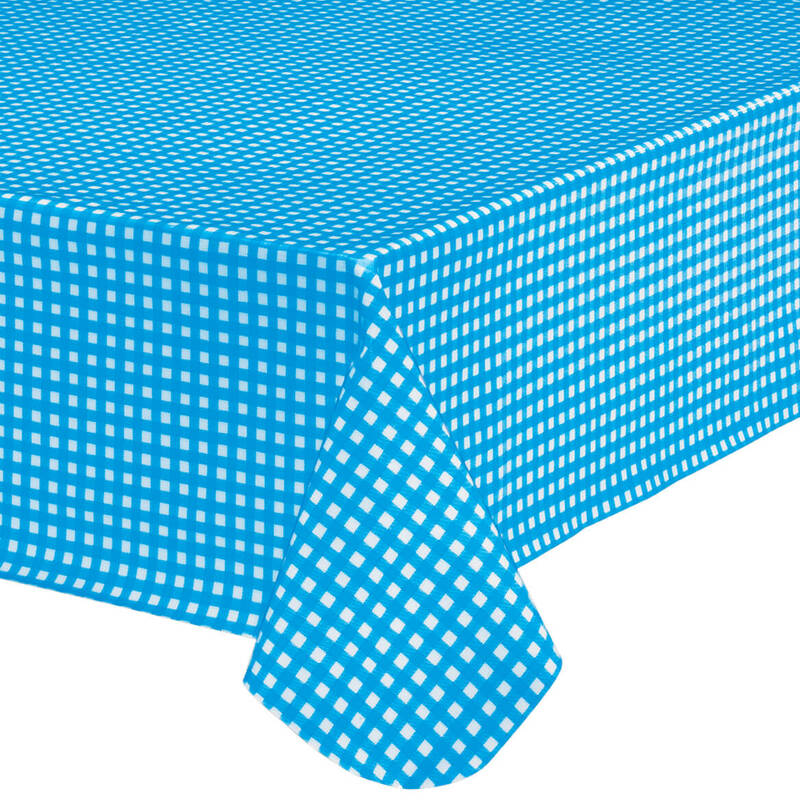 Do you have any blue oilcloth that will work? BEST ANSWER: Thank you for your question. Unfortunately we do not have any table covers that will fit that size table. We hope this information will be of help to you. 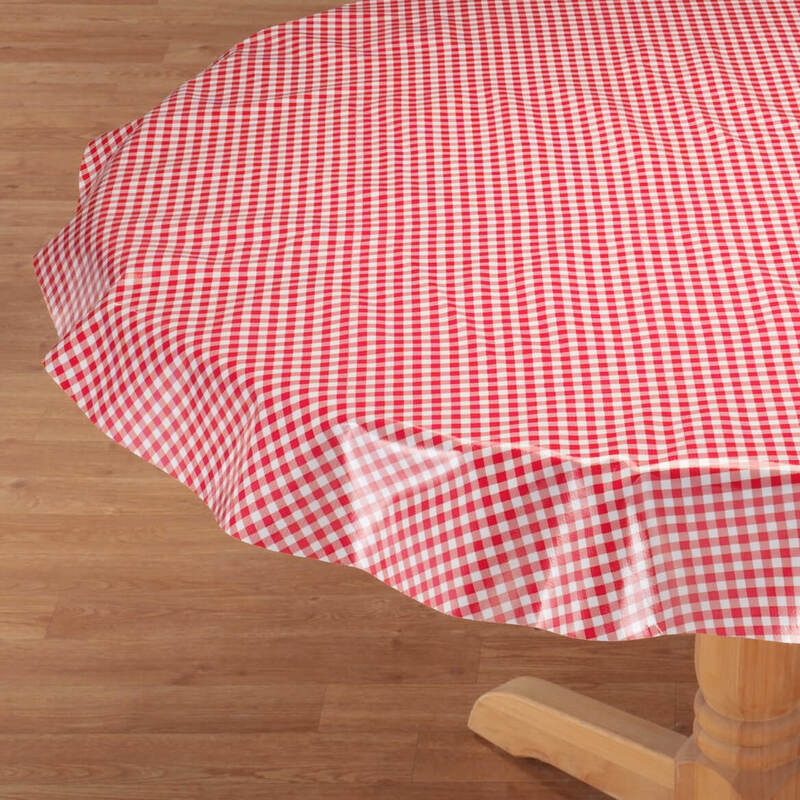 do you not have a 54" round Gingham oilcloth table cloth we have a 40" round table and i don't think a 4" hangover would be enough ? BEST ANSWER: Thank you for your question. 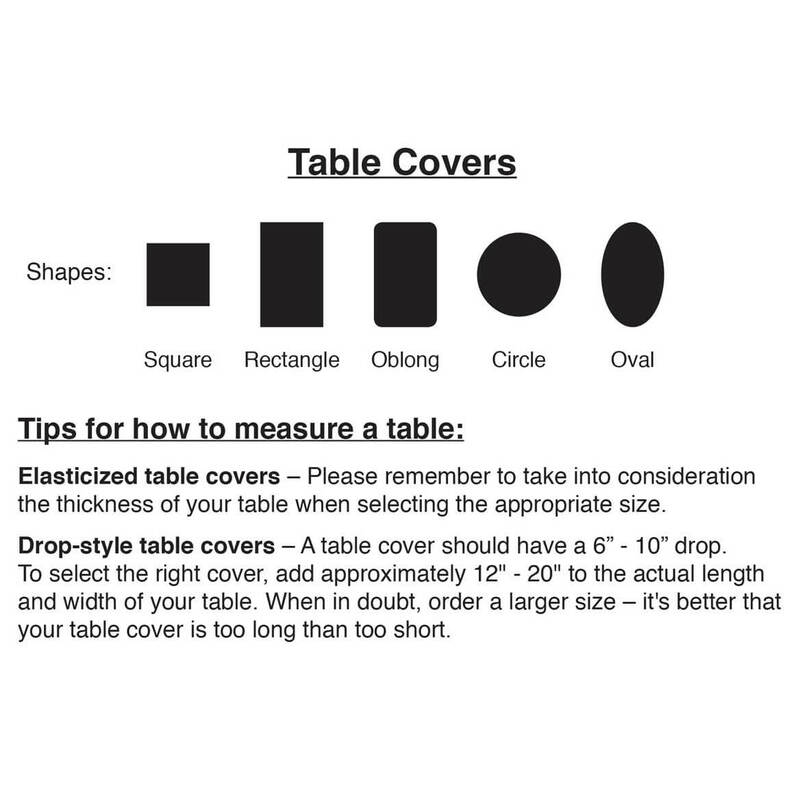 We do not carry this table cover in that size. We hope this information will be of help to you. 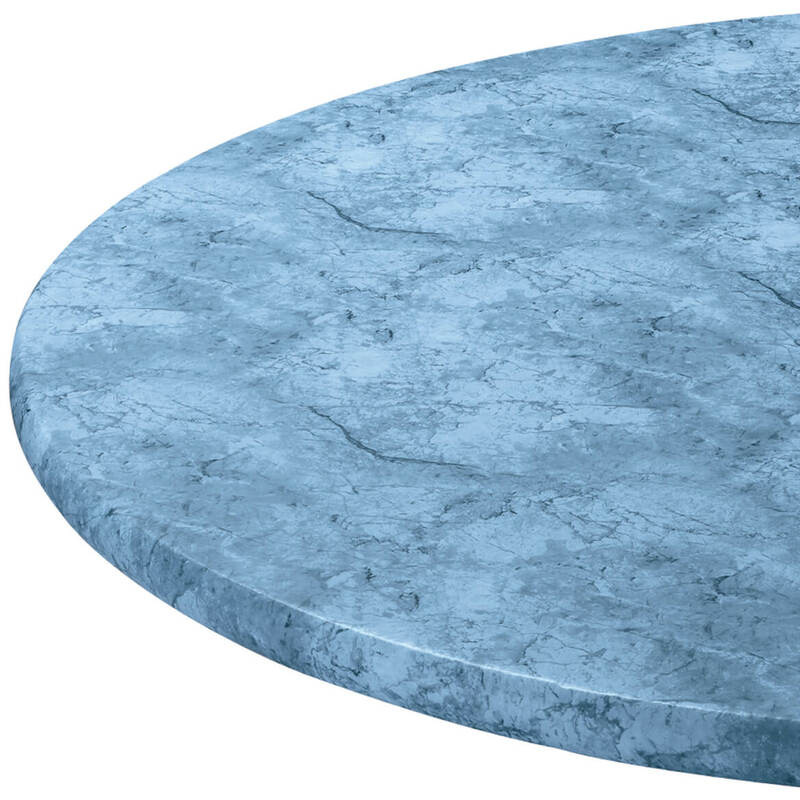 My table is 42" round with a 3" apron, is the 48" round exactly 48" or is it larger to drape enough around the table? I do not get the 48" size, it sounds as if it barely fits a 36"
BEST ANSWER: Thank you for your question. The 48 inch round is the size table this will fit up to, and still have a drape to it. We hope this information will be of help to you.